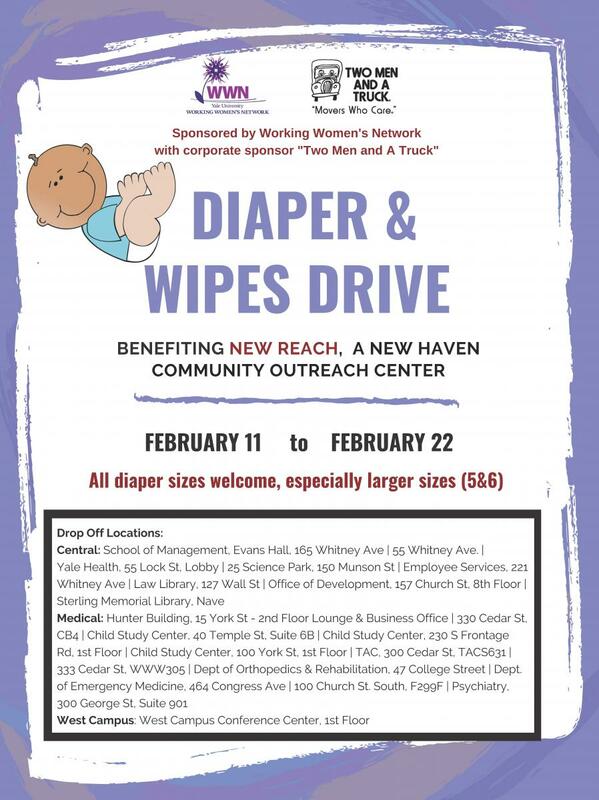 The 4th Annual Yale Diaper & Wipes Drive, sponsored by the Yale Working Women’s Network and corporate sponsor Two Men and A Truck, will take place from Monday, February 11 through Friday, February 22. Donation boxes will be hosted at the locations listed below. Once again, the Drive will benefit New Reach, an organization with a mission of inspiring independence for those affected by homelessness and poverty through a continuum of housing and support. All sizes of diapers are welcome, especially larger sizes (5 & 6). Monetary contributions can also be made here. On the donation page, in the comments block simply write “Yale Diaper Drive” so that the organization knows to put that money toward the purchase of diapers and wipes.